The 32 teams competing for the World Cup in Russia have each brought with them a distinctive football lexicon that reflects their country’s relationship with the sport. The cross comes into the box. This should be an easy one for the goalkeeper… but he’s got nowhere near it! He was flapping his hands all over the place – looks like we have a butterfly hunter between the posts! The ball’s loose. It falls invitingly for the striker. He’s surely going to score here… but no! He's stepped on a snake – he's missed his kick completely! It’s pinball in the penalty area now. Luckily this lot have got a bruising centre-back – a proper wardrobe – and he shoves an opponent out of the way before clearing the ball to safety. Pigeon’s wing and tree illustrations by Dan Leydon. Neat work from the holding midfielder – he hoovers up the loose ball and moves it on to a team-mate. Every side could do with a vacuum cleaner like him in their ranks to keep things tidy in midfield. Here’s the control tower – the central midfielder who seems to have an aerial view of proceedings and knows exactly where the ball needs to go. He takes a touch and sprays a pass out to the left wing. Oh, what a smooth pass that was! The winger didn’t even need to break stride! That was a butter pass if ever I’ve seen one. The winger is quickly closed down by an opponent, but he takes him out of the game! Fantastic skill. The defender charged in and he flicked the ball right over his head – he gave him a haircut! Great cross into the box, but that’s a total miskick from the striker! Aimed right and the ball went left – a real poop ball. One of the midfielders has kept the ball in play and oh, what a clever piece of skill! An opponent charged in, but he managed to slip the ball between his legs and collect it on the other side. Lovely little salad. The midfielder plays an aerial pass to a team-mate. It’s a little bit behind him, but that’s great improvisation! 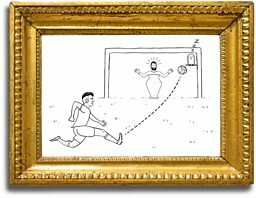 He produces a pigeon’s wing to help the ball on – lifting his foot out to one side and using his heel to volley the ball to a colleague. Superb technique! The forward attempts to control the ball, but oh dear! It hits him on the shin and bounces away. This guy’s got no technique whatsoever – he’s an absolute tree. The goalkeeper’s rooted to the spot! He’s standing there like a vase! WHAT A GOAL! Beautiful cross, emphatic header, keeper motionless, and the ball sails into the top corner – right where the owl sleeps. Do You Speak Football? A Glossary of Football Words and Phrases from Around the World is published by Bloomsbury. Does going first in penalties mean you win?